A child's handprints represent the innocence of childhood. Save this moment in time with a kid's handprint on canvas. Purchase a prepared canvas, which is primed and ready to be used, from your local art store. Choose an 10-by-10-inch size for the project and buy non-toxic acrylic paint for the craft. 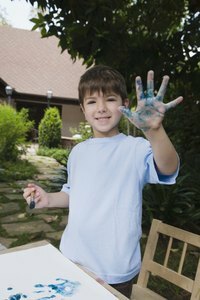 Acrylic paint is permanent and fast drying, and it should capture all the fine details of your child's handprints. Lay newspaper down on your workspace to prevent staining your table. Lay the prepared canvas on top of the newspaper. Typically artists paint on canvas with it standing vertical, but you need to lay it down for this project. Paint the entire canvas with ivory acrylic paint using a 2-inch paintbrush. Give it one even, thin coat using an up and down motion with the brush. Allow it to dry for two hours and then add another thin coat the same way. Allow it to dry for another two hours. Place a 1 1/2-inch thick hardback book underneath the canvas where you want the first hand print. Be sure the book is the right thickness and does not push the canvas up. You need a support for when your child presses his hand prints onto the canvas. Pour red acrylic paint into a shallow pan. Roll the paint with a 2-inch paint roller. Roll the red paint onto the first hand you wish to press onto the canvas. Be sure to roll the paint all over the hand. Press that hand onto the canvas. Lift the hand straight up to prevent the print from sliding. Move the book if necessary to the new location where the next print is going. Roll the red paint onto your child's other hand. Press it onto the canvas with the book support. Lift the hand straight up and wash your child's hands with soap and water immediately to prevent staining. Experiment with different colors and with adding text or other images to the canvas. Have your child draw a painting on the canvas and then add the hand prints. Siblings can print separate hand prints or one child can place a left hand print and another child uses the right hand. Wear old clothing to prevent staining.